My professional relationship with Marvel’s Iron Fist has been slim. I wrote three issues of Marvel Premiere back in the 1970s, issues notable only for my atrocious attempt to write Batroc the Leaper’s French accent and the momentous, however brief, creation a d first appearance of Misty Knight. I also wrote a fill-in issue of Power Man and Iron Fist titled “O Deadly Debutante,” of which I remain fond to this day. I haven’t kept with Iron Fist aka Danny Rand in recent years, save for being amused and entertained by his youthful variation in the current Ultimate Spider-Man cartoons on Disney XD. That Danny is a pleasant chap. The Danny Rand of the 12-issue Iron Fist: The Living Weapon [June 2014-July 2015] is a weary warrior questioning the decision he made in the mystical city of K’Un Lun. With the power of the Iron Fist his, Rand chose to turn away from eternal life in K’Un Lun to seek vengeance on the man responsible for the deaths of his father and mother. He lives in a splendid apartment with a view of the ghostly Rand Tower, structurally sound but left unrepaired since some past battle. It looks like a Jenga game that could come tumbling down with the next move. Writer and artist Kaare Kyle Andrews weaves a story of demons from the past haunting and attacking Danny. We see Iron Fist’s origin in greater detail than ever before, interwoven with a desperate fight for his power and his soul. As is usual with such retellings, some of what we thought we knew is wrong and the revelations take their mental and physical toll on Danny. It’s a true character journey, filled with crazy action, intriguing characters and, most important of all, a satisfying ending. The art and storytelling are distinctive. The former sometimes made me want to stop reading and admire the drawing. The latter made me keep reading, though I did go back after each issue to look at the drawing more closely. I don’t know how much of the events of this series had survived the woefully ill-considered Last Days/Secret Wars epic events and epic failures, but, regardless of all of that nonsense, Iron Fist: The Living Weapon stands on its own as a self-contained story. 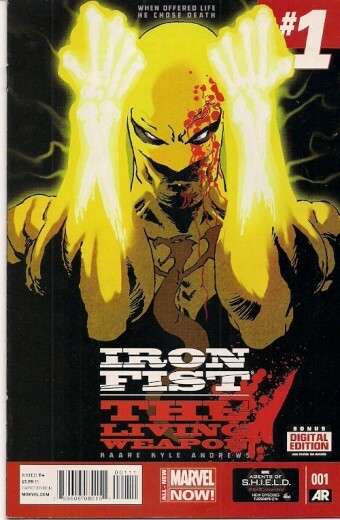 Iron Fist: The Living Weapon is collected in two books. They would make good holiday gifts for comics readers. In addition, given that a live-action Iron Fist series is in the works for Netflix, friends and loved ones who enjoyed Netflix’s live-action Daredevil series might also enjoy this comics series. Magazine subscriptions are the gifts that keeping all year round. Among my favorites are Alter Ego (edited by Roy Thomas), MAD (still funny after all these years) and The New Yorker (which fascinates and informs me on a weekly basis). Also on that list would be the one I’m recommending to you this week: Rick Norwood’s long-running Comics Revue. 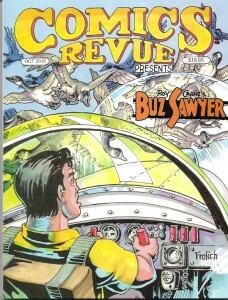 Each bimonthly issue of Comics Revue [$19.95] offers over 125 pages of great comic strips. The line-up is unparalleled: Lee Falk’s The Phantom from the 1950s and the 1960s, Tarzan by both John Celardo and Russ Manning, Mandrake the Magician, Flash Gordon, Buz Sawyer, Steve Canyon, Rick O’Shay, the delightful Sir Bagby, Modesty Blaise (perhaps my favorite adventure strip of all time), Gasoline Alley, Alley Oop and Krazy Kat. The reproduction of these comic strips is excellent. I like to spread out my reading of Comics Revue over several days, which lets me savor the various styles and textures of the strips. I try to save Modesty Blaise for dessert, but that generally turns out to be a losing battle. I love that woman. If I didn’t already have a subscription, Comics Revue would be high on my list of birthday/holiday gifts I’d like to receive. I always like to bring your attention to comics that are a bit out of the ordinary and, as such, something that might appeal to non-comics readers in your life. 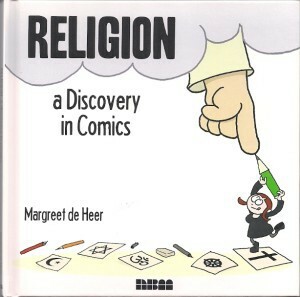 Margreet de Heer fits that bill with the second book in her “Discovery in Comics” series. Religion: A Discovery in Comics [NBM Publishing; $17.99] is a fun and serious look at the five major world religions. Though De Heer somehow managed to overlook my own First Church of Godzilla, this book is a winning combination of history, commentary and personal experience. I found it to be a balanced and supportive examination of these faiths – Judaism, Christianity, Islam, Hinduism, Buddhism – that extols their virtues while pointing out their shortcomings. Her overall point is that religion should unite us and not divide us. I’ll happily give an “Amen” to that. Please feel free to offer your own holiday gift suggestions in the comments section. I’ll be back next week with more of mine.